Does anyone have any knowledge to share of this particular boat, it's lineage, or 45 year old steel boats in general? HI: I owned one of these (1963) ,5 years to restore,boy did I learn stuff ,but besides my complete ignorance ,I had lots of time and brought extensive resources to bear and so pulled off the impossible. The hull design is a great one for crusing and its nice to bounce off reefs, rocks,docks and other boats (done all that), but there is nothing worth saving on that boat . In fact,some of the systems (read drive train ) were useless when new! All that said,give me a new metal boat for world cruising and the Amuthon makes a good liveaboard if you want to know what life was like in the eighteenth century; I did, but now I'm cured. For quick relief,call me if you feel yourself slipping into the abyss. Captsam's boat looks fabulous, and there is no opposition to fiberglass. The bulb fin and vestigial-skeg rudder do give us pause though. As far as "why steel," the real question is "why not this boat?" I hadn't really considered steel before because everything else in steel we'd seen in a size we're comfortable with looked like someone had stuck a prop on the back of an armored car. This thing looks and feels like a boat. At the very least, I've expanded my ideas of what could work for us. She may not be roomy by modern standards, but the interior size/layout is about what we're looking for. I was fully expecting to find a nightmare inside based on the cockpit wood. I was surprised enough to not yet walk away. I think the owner just gave up on boat - she seems to have been well-maintained up until fairly recently. There is no deformity on the deck ply where it overlaps the steel. I tapped a fair bit with the screwdriver handle, and she all sounds the same to me, even the strange bubbly spots on the hull. (And I couldn't find those from the inside, whatever that's worth.) I wasn't brave enough to poke. Interior access, as noted, is excellent. What few panels there are come off with a screw or two. Had that been different, we'd already be gone. I'm not sure what the lack of insulation means for us, but it's apparently not caused any unresolvable problems in the last 45 years. I've spent the last few years putzing around Alaska in a 65 year old airplane and sharing lots of long winter nights with a wood stove in a 6x8 wall tent. Confined spaces, even when combined with old machinery, aren't scary. If you think the engine room wiring is cool, wail until you see the mess in the quarterberth! My first thought was "if you have a bad dream in there, it's likely to get MUCH worse before it gets better!" The good news is, there's hardly any wiring in the boat. Starting over would be a pretty simple operation. We won't go to 50. We looked at a Pearson 390 and quickly dismissed it as way too much boat. Thanks again for all the comments - they're unimaginably helpful. I too am a fan of steel construction for a world cruising monohull; indeed, my last boat was a 1994 steel, Cartwright 36 pilothouse cutter. The ultimate strength, collision protection, ability to repair damage to the hull anywhere in the third world, the lack of osmosis, delamination and the ease of changing the interior layout (since interior bulkheads/cabinetry are not structural) are all positives. However, this is an old boat with an antiquated design. 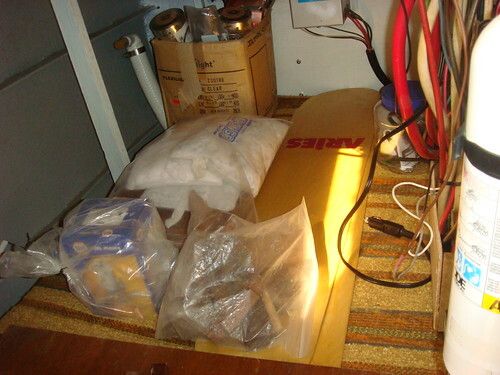 Furthermore, the plywood deck/coachouse reduces the inherent strength of all-steel construction, increases the risk of leaks and makes adding deck hardware/stantions/mooring cleats no different than on any wooden boat - more expensive and a recipe for rot. Personally, I would steer clear of this boat. When one considers the above plus the electrical issues, the transmission and the 'ballast', it strikes me as a recipe for disaster. If you are truly bitten by the bug, however, I would have a survey done by a commercial surveyor who has the equipment to check the plate thickness throughout. I would also want to make sure that the construction was appropriate; essentially, that the verticle frames are attached only to the stringers and not the hull (or that there are immense limber holes) and that the stringers cannot retain water against the hull). 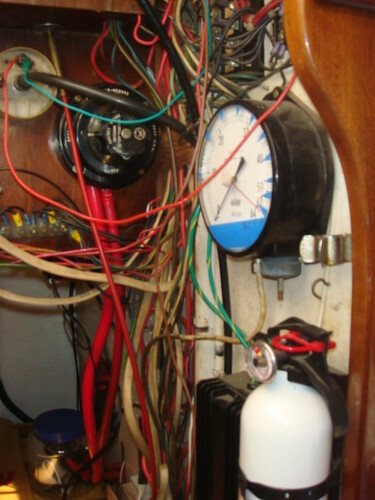 If you think the engine room wiring is cool, wail until you see the mess in the quarterberth! Even with those addtl. pictures I think it's a deal! You bump into a whale or a semi submerged container or just some major size driftwood while underway, you'll life to tell the story! When it comes to safety there simply is nothing like steel! Honestly: With that price tag (after doing a bit of negotiating accompanied by a lot of *sighs* and pointing at the mess of them cables (etc.) ) you should call yourself the owner of a quite nice and most of all safe boat. Have fun! And do keep us posted! Any place that wood touches steel is suspect. That is a big corrosion problem as the wood will hold moisture and the steel will rust away under the wood. Even if its in good shape now it will be very difficult to keep it that way. I emailed a Dutch builder that builds in steel and wood asking about the interface. I got no response from them. Have the hull ultrasound tested before purchasing if you are going that direction. There really is no other way to determine how much hull is left. Steel boats can be the worst boats out there, or the best boats out there. The key is to know the difference when you purchase, or have the skill set to transform the boat. That said, wood on steel is a recipe for disaster. It just is. The only boat I ever owned was steel. I always defer to superior knowledge and experience but I'm having a hard time understanding this problem of wood with steel . Wood holds moisture that corrodes steel? Well, the boat is going to live in moisture , I assume ,and If the steel is prepared , properly painted ( my boat was 30 years old and we didn't have access the common high tech epoxys you can find now) and properly looked after I really don't see the problem , provided you don't have "no access spots" where corrosion will be out of your reach to deal with . People who fret about a bit of corrosion seem unfazed by delamination , gelcoat voids or osmosis. I think that the issue is that the boat will require intensive maintenance , no doubt there. For some people that's a deal breaker , for others it's a great part of owning a boat. Like it was mentioned here, the best survey you can afford will be a great investment . For the past 12 years I averaged over 1200 miles a month , all on plastic boats , and I have no doubt that steel is the superior building material for ocean going yachts. Corrosion and all. The problem with wood on steel is that wood is a much better abrader of paint than air or water. Putting a wooden superstructure on a steel hull is just asking for a neverending painting project unless the wooden structure is such that it never flexes or moves. Given the forces on the superstructure from motion and the pounding of waves, I'm not hopeful. Steel boats are great; got one myself. But somethings don't make sense with steel boats, IMO. The steel in cement ballast is owner-reported, so who knows what's actually down there. You really have to worry about what you can't see. The boat may or may not be OK. Depends on how much thickness there is left in the plating and structural elements. Do not under any circumstances buy a steel boat without this test. I was offered to partner in a steel boat. It's a great boat, well loved with a lot of local history. The chain plates photographed almost like yours. The wiring was all there but largely a "spaghetti" factory like yours. The gear was all robust and felt good to hand. The hydraulic steering had 2 turns of play in it. She sailed like a tank - super solid under feet. I passed. Another friend bought it. During anti foul application someone put a putty knife through the hull near the keel. There was nothing there but paint. The new owner spent 3+ weeks jackhammering out the cement ballast and is now welding in new panels. He will get there eventually and will have "saved" the boat. An ultrasonic test would likely have made his pass on this boat. Ultrasound is now firmly on my "or I'll walk away" list. I'm still a bit scared of the powertrain setup. The engine seems fairly popular (if dated) and parts are available - in Europe, anyway. Has anyone had any experience with a not-quite-V-Drive belt setup? The broker didn't want me removing the cockpit floor to get a better look, so I suppose I'd have to pay for a survey to even find out what the transmission is and where exactly that shaft disappears to. I think I might make having a look under there a precondition to making a formal offer, should I decide to do so. I suppose it's up to the seller, but this thing is looking more and more like a $10,000 boat - if there are no other surprises. The survey is usually at the buyers cost. My general philosophy on looking at boats is either, "I don't want to work on a boat. I want to go sailing." or "I don't want to deal with the hidden costs of a fixer upper." I would not necessarily hesitate at a really cheap fixer upper. There is a really nice 30 footer here. The owner thinks it is a $30k boat. Everyone with any real interest knows it needs $30-$40k of work. Everyone offers to take it for free and he refuses to sell. The boat will sink soon. Regarding the cost of ultra sound survey, everything is subject to negotiation but generally the buyer is expected to pay for it. Steel boats present much greater risk than other materials. As pointed out, a steel boat can look fantastic with recent paint hiding the problems, but actually present a huge disaster even to the point of being on the edge of sinking. With all due respect, anybody stupid enough to buy a steel boat without ultrasound testing deserves whatever problems they buy. Ultra sound testing is just part of the cost of purchasing and owning a steel hull. Also be aware that your insurance company might require more testing every five or ten years to renew your insurance. I plan to do it again before any long distance cruising, because I think that is good practice. No, it's not cheap. But it's cheap insurance compared to what's at risk.